Citrus has a long history in Florida, and the fruit and the state have become synonymous. However, all of that is threatened now because of citrus greening. For a frame of reference, Florida citrus growers harvested 240 million boxes of oranges and 40.9 million boxes of grapefruit in the 2003 to 2004 season. In comparison, the 2015 to 2016 citrus season saw 81.6 million boxes of citrus harvested. In the 2016 to 2017 season, Florida citrus growers produced 68.7 million boxes. If the latest USDA Citrus forecast is any indication, the Florida citrus industry continues to be adversely affected by long-term challenges—citrus greening—and recent disasters—Hurricane Irma. With four months’ worth of citrus forecasts in the history books, it’s easy to see the hardships that Florida citrus growers are facing. Explore the latest USDA Citrus forecast for Florida, and see the history of the season thus far, below. It highlights the dire need for a workable solution to citrus greening. 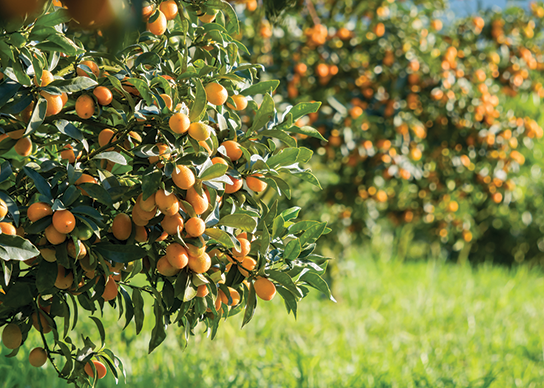 Citrus has a long history in Florida, and the fruit and the state have become synonymous. However, all of that is threatened now because of citrus greening. For a frame of reference, Florida citrus growers harvested 240 million boxes of oranges and 40.9 million boxes of grapefruit in the 2003 to 2004 season. In comparison, the 2015 to 2016 citrus season saw 81.6 million boxes of citrus harvested. In the 2016 to 2017 season, Florida citrus growers produced 68.7 million boxes. The yearly Florida citrus harvest have fallen steadily since the arrival of citrus greening in 2005, and lower and lower forecasts have followed since. Every citrus grower in Florida was prepared for a low initial USDA citrus forecast in October. Then, at the beginning of September, Hurricane Irma cut a large swath of devastation through The Sunshine State. The citrus industry was largely affected, as fruit was already on the branch. Most growers suffered extensive fruit loss, flooding, and tree loss. Estimates put losses anywhere from 30 percent to 70 percent, with a dollar amount of $760 million. The extreme losses suffered by the Florida citrus industry from Hurricane Irma prepared everyone for truly low numbers when the first USDA forecast came out in October. However, many were surprised when the prediction was set at 54 million boxes. Citrus industry leaders from Citrus Mutual President, Mike Sparks, to Commissioner of Agriculture, Adam Putnam, expressed their disbelief at the first USDA forecast with the feeling that it was too high. The USDA maintained that data from prior to the storm did go into the calculations of the initial forecast. Then, in November the USDA citrus forecast for Florida dropped to 50 million boxes of citrus. While no one wanted a lower forecast, the numbers seemed more in line with the losses caused by the hurricane. The December USDA citrus forecast for Florida was lower still, with 46 million boxes of oranges predicted, and 4.65 million boxes of grapefruit. The latest USDA forecast, released January 12th, held steady, one of the few positives that have been seen in this year’s citrus industry thus far. However, oranges are forecast down 33 percent, and grapefruit down 40 percent, over last year’s totals. All told, the season is shaping up to be the lowest in 75 years.